We all know that during the second half of the John Paul II pontificate a great number of conservative Catholic laity took seriously the call to the “New Evangelization” and started working for the Church. It’s a common story in dioceses and the various offices of national conferences bishops around the world. A great many of these are what we call “Generation X” people who were raised and lived through the post-conciliar period, watching as their parents’ generation of priests and bishops systematically tore down the edifice of the Church – sometimes literally in bricks and stones, but as often in the form of the terrible destruction of our patrimony of Catholic social and moral culture. We who were born in the mid-to-late 60s and began to be working adults in the 80s and 90s, found ourselves presented with the grim irony of a Catholic institution that had become a toxic moral wasteland where we knew instinctively it was deadly to tread for long. But for many of us, the call of John Paul II, especially in his addresses at World Youth Days, seemed like a shaft of light in the darkness. The fashion at the time was to speak of the “vocation of the laity” to be actively involved in the Church, and there was no question that we saw much work to be done, including many battles to be fought with the Me-Generation old guard. Many entered post-graduate degree programmes at approved “conservative” Catholic institutions, taking degrees in theology. Slowly, and often in the face of great resistance, faithful lay Catholics – often married men – moved into positions of influence behind the scenes, and started to effect what changes they could. Very often their work centered around the “life and family” issues; abortion, marriage and family life. Other popular areas are Catholic education and liturgy. One case is a friend who, having married instead of going forward into the priesthood, took a degree at the late, lamented Pope John Paul II Institute, and began work in the great effort to restore the Church’s public voice on “life and family” matters. He has done this work for many years now, he has married and bought a house and now has four small children. He wrote to me a short time ago in a kind of agony of indecision. Faced with the Filial Correction, he felt obliged in conscience to sign; as a representative of a bishops’ conference, he believed it would jeopardize his employment, his home, the spiritual and material wellbeing of his wife and children, their hopes for a secure future. 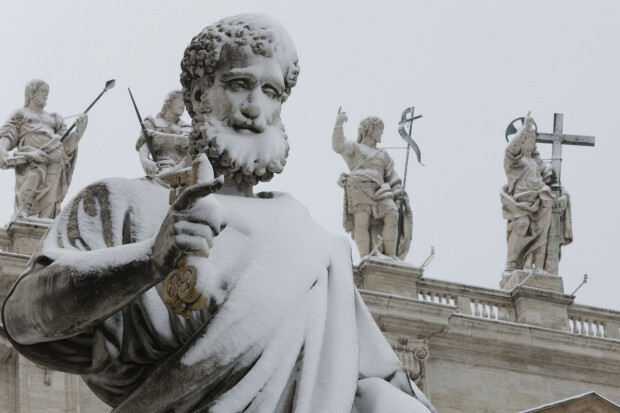 “It’s the time when every worldly and natural thing we’ve been clinging to – papal positivism foremost – will be stripped away from us.” He didn’t know what I meant by the term, and had no idea there was a distinction to be made between “conservative” and traditionalist. I was happy to help him explore these concepts, as you may imagine. This article appears in the new Print/E-ediiton of The Remnant. To see what else is in this issue subscribe today. He said to me a few weeks ago, “I SO, so wish I were not working ‘for the Church’. Hungry children leave me with few or no alternatives.” I remember years ago when he had received the offer to study with a good job promised at the end, and how we had all congratulated him on securing such an ideal direction in life, particularly after the uncertainties that had accompanied his seminary studies. My friend eventually signed the Filial Correction, after consulting with his wife and a spiritual director. He didn’t specify, but I assume he also spoke to our mutual friend the “sympathetic” bishop. We await the outcome. This is a message I received a few days ago from another friend who has spent many years giving her life for the Church as a layperson working for a large diocese in a western country. I “met” this person online as a spokesman for her diocese during my work for LifeSite, and I have dealt with her for many years on a wide array of issues, so I know her to be a naturally restrained and measured person, not given to great outbursts, and certainly not a “rad trad”. My friend fits the profile I outlined above, having completed a degree in theology and worked for nearly 20 years in areas pertaining to abortion, euthanasia, sexual morality, family and marriage. For reasons that will be obvious, I will not be revealing anything about my friend’s location. What I can reveal is that she works for a large and important diocese whose “positions” on these topics are frequently sought out by secular as well as Catholic media outlets. Though she herself is mainly unknown personally, because of her position she is, in short, a “leading voice” in the English-language Catholic world. Her observations may seem harsh, but they are honest, and they come from someone who has risked much for the Kingdom, and has been of necessity carefully silent on many serious problems, dating well before the Bergoglian period. My friend has a family, a mortgage, a whole structure of normal lay life, and knows she is now – as so many others – coming to a point where her conscience can no longer allow her to represent the organisation that pays her. She’s not there yet, but she’s starting to give serious consideration to alternatives. Don’t get me wrong I felt enormously blessed and privileged to have earned a pretty good living since 19__ working in various roles within the Church and trying as best I could to be some degree of positive influence in an environment where (particularly in the [location] context) the vast majority of priests and worse, their overbearing self-referential overlords the hierarchs, are so cowardly compliant to anti-life, anti-marriage and family laws and policies as to make one vomit. ... Up until now I have contented myself with the conviction that I felt I was where I needed to be according to God’s will, despite complete absence of credible episcopal support, shining a small light in a very darkened Church, a Church where the darkness is added to by my own sinfulness. Up until now I’ve worked on the basis that so long as the Cardinal or bishops didn’t say “No, you cannot do that,” I carried on anyway because it felt right to try and swamp error with truth. It’s still right to do that but increasingly hard to do that in the Bergoglian paradigm. In that paradigm which the successors of the apostles (the good ones that is) struggle to find ways to accommodate themselves and preserve their oh so precious ‘unity at all costs’ policy, the likes of me find the day rapidly approaching where working for them is in truth abrasive to the conscience. The transgender juggernaut is the line in the sand they will fail to draw and as a mother of two young children I think that’s me well and truly out of the ‘Catholic’ ecclesiastical system. So my crossroads is here and I would be glad of your humble prayers from your peaceful little corner of ‘Catholic’ Italy. I have a friend in the US who is a priest in a small community with whom I mostly communicate on Facebook. He says that he hears similar things from priests, and we know that the position of faithful Catholic priests is uniquely dreadful. Things have always been difficult since the Council and the Trads know all about being pushed out, ostracized, bullied, threatened and otherwise abused. But that bullying, in the Bergoglian Catholic Church, has spread outwards from the easy-to-kick, isolated weirdos to everyone who retains even a shred of Catholicity. The Bergoglian oligarchy is making it clear what kind of man you have to be to “make it” in today’s hip and cool Church of Mercy Inc. If you aren’t a James Martin SJ, or a Blase Cupich, a Massimo Faggioli or a Greg Burke, you’re out. If the pressure of your conscience isn’t enough, they are certainly going to find ways to get rid of you soon. My priest friend in the US told me there are various online groups – mostly under strict secrecy – for priests to talk about what they are going to do when the final crunch comes and the demand to pinch a grain to the false Bergoglian god is made. My friend and I discussed that perhaps a new association for faithful Catholic laymen in similar circumstances might not be amiss. It’s easy enough to predict that there will soon be a need for faithful Catholic lawyers to bring suits against the Church for wrongful dismissal and similar conflicts. The mechanics of such an association might prove difficult, but it can never be a bad thing for faithful Catholics to band together to defend the Faith and each other from hostile secularists, clerical or lay. Whatever we do, it seems clear that at least for now we are nearing the end of the time when that generation of “JPII Catholics” will be able to maintain their positions of influence in the institutions of the Church. Whatever we hope for the long term, this is the new normal, and we are going to have to start working out ways to continue to function as Catholics and to exercise our vocations within it. With the overnight transformation of institutions like the JPII Institute, and incidents like the firing of Joseph Seifert, it seems clear that the Bergoglian/Kasperian purge is spreading from priests to the laity. It’s something we are going to have to face squarely and courageously, if only for the sake of the children.